Since I went back to work I failed to document any of my quarterly goals. I am back to that. Recording things keeps me motivated. I know 2014 is already gone but I just cant keep this until January 2015. NET WORTH: I will have to check the values of all the investments and real estate debt, add them up and re-calculate our net worth. More like the beginning. 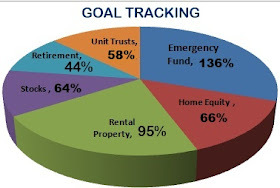 EMERGENCY FUND: We did empty our EF whilst acquiring a property beginning of this year. I have to update you guys on that later. We are now slowly building this up again. Meanwhile, the new acquisition is still vacant bringing in no income as we are still working on it. We will keep the EF at 6 months worth of our household expenses. We are now at 14%. We will take it to 21% of the target. Growing it by a third (33%). REAL ESTATE: Nothing major here. We will be working on extra security in our residence. December approaches and sadly with higher occurrences of burglaries. STOCKS AND DIVIDENDS: Nothing planned here except for the normal ETFs. EXTRA INCOME: Trying to take online income up by at least 25% by end of November. Enroll for a short course related to my work. I never thought I would have this goal especially at such a busy time at work. I really warmed up to work nicely. I like it. Lets see End November if these actually fly. I also want to throw a no spend week challenge with interested readers from January.